Coach was particular about this: go over the top rope. I'm glad he said it, because otherwise I'd have ducked between the top and the one beneath it. "Sealing the ring": you walk around, tap the corners one-two-three and genuflect; in between the corners, you run your right hand along the rope. You're getting rid of bad energy/forces. The thing on my head is a mongkol - it's a traditional totem of good fortune, and I think the fighter isn't really supposed to handle it (only his coach is). Considering that this -- me getting freaking hit in the freaking face -- happened enough that I lost the fight, I figured I should include a shot of it. Honestly I don't have that money, because all my pictures come from my peoples. I like this photo and the one above it because I think it reflects what the fight was actually like: a chaotic, scuffling mess. This one reflects what I would like the whole fight to have been like. But at least it did happen! A deep bromance between me and L---, the dude who beat me up. These 3 kinda tell their story on their own. Dammit. As promised, intersections. 5 pictures of intersections, plus 1 bonus. Except I was wrong. I think they aren't pictures of intersections. They're pictures that include intersections, and in which the intersections are centered as if they are the subject of the photo for who-knows-why. But I'm pretty sure, in each case, that these pictures are "of" specific buildings that in any one of them look like background objects, but that in fact seem to be the defining feature that ties the photos together to tell the story of this day in... Pictures on My Phone. Here we go. The first photo is of an intersection. There's a state road sign for "East 20", some green trees across the street, and what I assume is East 20 running diagonally away from us into the upper right of the photo. There's a bus and a gazebo with a down escalator that has a public transportation look to it. And, in the background as if incidental, there is a kind of handsome white tower with the letters "CSU" in signage relief on each of the 2 visible sides, looking out over the city and the scene. Our hero has moved to Cleveland to attend CSU, remember. Far right on the photo, there is a sign for "Marino's Hair Cutting," with a little arrow pointing you there. In the next photo it comes together. It's a photo of an intersection; our hero is not (yet) awesome at framing, maybe. BUT along the periphery of this photo we have several things. Foreground and 58% of the photo or so is a big spacious intersection in a big spacious American city: wide streets, street lights, scattered people crossing. Background, though: green and trees, and peaking up beyond them a handsome glass building that we recognize from earlier photos -- the handsome low-slung glass building that adjoined the courtyard our hero had photographed the day previous. Also off to the right, and it really looks incidental but subsequent photos knit it in as important, is another labeled CSU building, this one short and squat and tan, with signage along the top reading "Monte Ahuja College of Business," which is apparently currently undergoing a conversion from a 4-credit to 3-credit course system, with which I wish them godspeed it sounds like a nightmare. I couldn't find anything on its site for an abbrevation by which this long-named school prefers to be known, so we'll call it MACoB from here on out. Centered in this photo -- perhaps this is the subject -- is a tall streetlamp pole with a banner on it, green background white letters running sideways: "Cleveland State University"; small font horizontal: "Engaged Learning". Next is really just an adjustment of the previous. Our hero has repositioned to get a different angle on the intersection of what we can now see is Euclid Street. Incidentally, from the formal perspective of framing but probably not from the perspective of why this photo was taken, this also gives a straight-on (background) view of the MACoB building, foregrounded by street, intersection, ersatz red cable car tourist bus thing, park/courtyard from previous photo series, and trees. But it's there. To give our hero credit, and put snark aside, these photos do a great job of conveying the physical context in which these buildings are placed. They'd be great illustrative photos to share with, for example, friends back home, or perhaps with parents whose pictures one carries in one's wallet. The next two photos are even more of a duo, and they're what confirmed me in this "the background buildings are really the point" thing. You may disagree, reader, but you haven't seen the photos and you probably never will because once I post this I'm deleting them. (Not for reasons of narrative elegance. Because I'm compulsive and it's satisfying. Also to free them, or something. Whatever.) Anyway these two photos: guess what two intersections. A broad avenue, it looks maybe like a residential neighborhood with some city-ish multifamily houses on the left, and a kind of neat old fashioned neon "GREYHOUND" sign on a building across the street, a building with Art Deco curves and long Art Deco window channels inset. But the subject of these photos, now that we've learned to read our hero's work, is clear. It is the brown, rather unhandsome 1960s/'70s looking mid-rise residential building with one long flat side of smallish windows and one narrow side of concrete balconies facing us. It looms over the scene like an implication, which I wrote and I'm sticking with but I'm unsure an implication of what. The second photo just comes closer to this same building, with the remarkable achievement of still keeping it like a background fixture and taking the intersection one block closer as its centered subject. But there is the building again, emerging. This is not the Statler Arms, which we'd earlier conjectured might be where our hero took up residence when he came to Cleveland. The Statler Arms looks, frankly, a lot nicer. So what is this other building? It's residential. Is it where he lives? Was he crashing at the Statler Arms? Has he not decided yet, so he is sharing the options with his parents/whomever back home was getting these photos? Dunno. Dunno dunno dunno. Maybe subsequent photos will clarify. The final photo of this day is different. It's a photo of a computer monitor, specifically of a web browser on a CSU Staff page: the photo features 5.5 thumbnail portraits of people with @csuohio.edu addresses and job titles. Centered -- and in this case I'm going to say I think the centered thing is the thing -- is a woman who works at the College of Business in a capacity I'd be curious about if I came to the U.S. to pursue an MBA and was looking to stay afterwards. Why take a photo of a screen with her information? My guess is just that people record important info all kinds of ways -- maybe that was easiest at the moment. Here's the 2nd of 3 of these: another piece that I wrote for The Daily but that never ran. It wasn’t shocking when Captain Jonathan Chaddock’s ship blew up - wood, flesh and smoking mainsail settling into the waters near the earthen platforms and cannons of Castle Island, Boston. After all, Chaddock was “a loose profligate man,” according to lay historian Thomas Hutchinson, with “a crew like himself.” They had arrived in Boston Harbor that spring of 1643, a band of unruly privateers, and fallen straight to buccaneering and loutishness: the Captain himself was brought before the magistrate and fined 20 pounds after drawing his sword and threatening to murder his own first mate in a bar. Three of their company had already drowned in a previous harbor accident. So, when two powder kegs on Chaddock’s 30-ton pinnace “took fire and blew her up” as his crew worked that 2nd of November, no-one was especially astonished. Particularly since – according to the contemporary account of John Winthrop, then governor of the Massachusetts Bay Colony – the cause may have been one of them recklessly sparking pistols. Five men were immediately “destroyed”; three remaining survived with bad burns. Far more alarming than the accident was the haunting that followed. Then: voices. “Divers godly persons” further south, near the waters between Boston and the rural town of Dorchester, heard a voice calling out “in a most dreadful manner, boy boy come away away; and it suddenly shifted from one place to another a great distance, about 20 times.” This sonic apparition reappeared a fortnight later, near Noddle’s Island (close to where Logan Airport sits today). Governor Winthrop is really our only source on this. Historians of subsequent decades – Thomas Hutchinson (also a successor of Winthrop’s as colonial governor) and clergyman William Hubbard -- faithfully recount his version (very faithfully, as one who hasn’t studied might “faithfully recount” a friend’s exam). There is no real reason, however, to doubt the long-serving Winthrop. He is credulous throughout his journals, recording what he is told without judgment, but there is no evidence that he himself is a fabulist. Perhaps the incidents can be attributed to natural, physical phenomena? Probably not. St. Elmo’s Fire requires an object – optimally a pointed one – to focus electrical fields into its distinctive blue flame. Will-o’-wisps are a terrestrial enchantment, gases from decaying plant matter oxidizing. What the sightings sound most like is ball lightning, a phenomenon that “resembles a glowing sphere” and “does not obey the whims of wind or the laws of gravity,” according to National Geographic’s summary of numerous first-person accounts. Unhelpfully, this turns out to be basically the same as calling the prodigies “lights on the harbor that sure look like ghosts”: ball lightning is something of an umbrella term for stories like this, and science has yet to provide a clear explanation for what it could be. Winthrop’s own opinion is simple. “It is also to be observed,” he notes, that two ships – Chaddock’s and another – had recently blown up in Boston Harbor, and that both were full of men “such as despised us and the ordinance of God amongst us.” This “It is to be observed” is a signal phrase of Winthrop’s religious disapproval: it was also “to be observed”, for example, that it was “on the Lord’s day” that a lecherous Dutchman was slain, or that three fisherman drowned while drinking. The governor also dutifully reports another theory, based on an entirely different set of supernatural covenants. One of Chaddock’s slain crewmen, his name lost to history, was reportedly a necromancer, suspected of murdering his master in Virginia and having done “some strange things in his way…hither.” This man’s remains, alone amongst those killed in the blast and unusually for sailors lost in the Harbor, were never found. Perhaps his shade, the rumors suggested, summoned fellow apparitions in its unburied disquiet. This focus on the man’s body is intriguing. The Puritans did not imbue the fallen human form with any inherent sanctity. Funerals and headstones were simple and austere, and the dead were not buried on Church grounds. A Puritan ghost would never hang about, demanding a proper burial. Clearly, a different set of rules applied to a sorcerer’s shade – just as different rules applied to Chaddock and all such “proud and intemperate men” who chose to live outside the rules that so bounded Boston’s new arrivals. These rough men, indeed, were just one kind of “other” assailing the Puritans’ purity: the Quakers, forced to worship in secret on Noddle’s Island because the Puritan authorities found them so alarming; the Pequot, Narragansett, and Mohegan tribes, whom the colony’s leaders viewed with a mix of missionary and competitive zeal. The Pilgrims lived in wary compromise between their own strict codes and what must have often seemed the brutal, ongoing insanity of the new world into which they had ventured. In this we may find, then, one root of this beguiling story. As Thomas Hutchinson wrote over a century later (in his own words, for once): “They had an ocean, a thousand leagues in extent, between them and all the delights of life which they had once enjoyed. On their backs they had a wilderness without limits. As soon as it was dark, their ears were filled with the roaring of wolves and other savage beafts, or which was much worse, the yells of savage men. Where there was any gloom upon the mind, such a scene must tend to increase it.” The strangeness of Chaddock and the rest of his godless crew may have been, to the Puritan mind, too much for even gunpowder to erase – their shades left dancing on the Harbor, like the threat of an encroaching human wilderness. I had the good fortune to write a bunch of pieces for The Daily's "History Page" -- an elegant little corner of that rather eclectic paper, which presented 1000-word vignettes of American history. On three occasions, pieces I wrote didn't run. I'm posting them here for the baying masses who watch this site constantly for updates. In light of Felix Baumgartner's extraordinary jump, I'm starting with a piece on the record Baumgartner broke. At an altitude of 90,000 feet, freefalling at 615 miles per hour, United States Air Force captain Joseph Kittinger began to slow down. His translucent mylar helium balloon was long gone, drifting away like an airborne jellyfish; otherwise it was hard for him to gauge his speed by sight. “When you’re 20 miles above the earth, there are no visual cues,” he’d later say – just the azure-white bend of the clouded earth, the blackness of space, and a dark blue horizon line as one bled into the other. It was 10:12 a.m. EDT on the morning of August 16, 1960, and Kittinger was executing the culminating experiment of a military program that combined sheer gutsiness and pragmatic research to serve a rising nation’s flight into the future. The name of the program was Project Excelsior, and it took place in the years between the USSR’s launch of Sputnik in 1957 and President Kennedy’s 1961 vow to develop a focused national space program. America was dedicating significant resources to expanding its technological and military capabilities, and programs like Excelsior -- Latin for “higher” -- were focal points of both strategic interest and national myth-building. Excelsior’s primary objective was straightforward. Jet engines meant that new aircraft went really high and really fast, and a new system was needed to assure that pilots bailing out in the earth’s hostile upper atmosphere survived. The secondary purpose was to test how a human being wearing only protective suiting could survive and function above “Armstrong’s Line” (around 65,000 feet), where low atmospheric pressure and temperature would incapacitate and kill anyone inadequately shielded. Success meant navigating between two contradictory imperatives. Earlier tests had confirmed that a bailing pilot could not deploy a parachute in the stratosphere. Terminal velocity through the thin air was too high, and the environment too killing: a 1943 test-pilot had nearly died when the 40-g shock of releasing a chute at 40,000 feet had knocked him unconscious at a freezing, suffocating altitude. The jumper needed to freefall into the lower atmosphere before pulling the cord. This, however, introduced the “deathspin” problem. Testing had demonstrated that humans would spin upon reaching terminal velocity, and fast: up to 200 revolutions per minute, at which rate centrifugal force would overpower the heart’s ability to pump blood away from the extremities. Project Excelsior had to perfect a system that allowed a falling body to drop to safe atmosphere quickly, without inducing a fatal spin. The falling body who’d be testing the system was Joseph Kittinger, a thin, red-haired Floridian with thick, amiable features. He’d been a test-pilot on projects dedicated to flying faster and higher since 1954. The team included a flight surgeon, veteran parachute packers, pressure suit experts, and Francis Beaupre, the designer of the parachute system that (the Air Force hoped) solved the spin conundrum. The key element of Beaupre’s system was a small, stabilizing parachute that deployed shortly after the jumper began descent, not to slow the fall but to lift center of gravity and thus avoid deadspin. Excelsior’s development process was iterative and incremental -- endless brainstorming what-if sessions, establishing fail-safes for all imaginable contingencies. Some of those increments, of course, involved Kittinger leaping out of gondolas tens of thousands of feet above the earth. The August 1960 jump, actually the project’s third, was aimed at testing the systems from over 100,000 feet. In footage of the morning’s preparations, Kittinger’s eyes peek out watchful and still, marking the team latching and double-checking his gear: the bulky pressure suit and helmet that would allow him to survive temperatures of minus-104 degrees Fahrenheit and air pressure so low that the moisture in his lungs and mouth would boil if exposed; Beaupre’s multi-parachute system; the bright orange instrument panel strapped to his rear-end. It took two team members, arms hooked under his, to hoist Kittinger up into the balloon’s gondola. Ninety-one minutes later, the captain stood 102,800 feet -- about 20 miles -- above the surface of the earth. A small yellow sign, affixed with red duct tape to the gondola’s edge, confirmed: “THIS IS THE HIGHEST STEP IN THE WORLD. “I said a silent prayer, and I jumped,” Kittinger later recalled. “The most beautiful view came in the first few seconds … It was very quiet, very still … It seemed that the balloon was drifting up, away from me into a very dark blue sky.” Kittinger accelerated rapidly through frigid darkness, and his stabilizing chute deployed successfully after about 15 seconds. He freefell for four-and-a-half minutes, his only frame of reference the cloud layer that eventually rose up to envelop him, obscuring the canopy of space. Finally, his main parachute deployed at around 20,000 feet, and after nine minutes of conventional descent he landed on a brushy patch of New Mexico desert near the village of Tularosa. His instrument box did not disengage as intended, and bruised his leg badly. This was the only injury he sustained. “Space” officially begins 62 miles above us. Kittinger never made it there: News coverage of his record-breaking jump mooted him as a possible astronaut, but he wound up serving at lower altitudes as an air commander in Vietnam, where he was shot down during a voluntary third tour and spent nearly a year as a POW. He made it safely home, and in 1984 completed the first solo balloon flight across the Atlantic. Beaupre’s system, validated by the last two Excelsior jumps, was widely influential on designs still used today to save pilots ejecting from high-altitude aircraft. And inevitably, daredevils are still trying to break the Excelsior records for highest parachute jump, longest freefall (with a stabilizing chute), and highest human velocity through the atmosphere. Kittinger has advised some such efforts, such as Austrian Felix Baumgartner’s ongoing project to make a 120,000 foot, sound-barrier breaking leap. Kittinger and his team weren’t out to set records, however. “We did it to gather information,” he later said. “My job was to discover things while falling.” And footage from the 35-mm motor-driven camera affixed to the bottom of his gondola shows just that: a man in grey jumpsuit and white helmet, dark against the contoured cloud background below, feet pedaling slightly as he plummets to earth, strapped tight into the ingenuity that will see him safely home. This is a review of some kinds of eggs I eat. Look, no one's forcing you to be here. 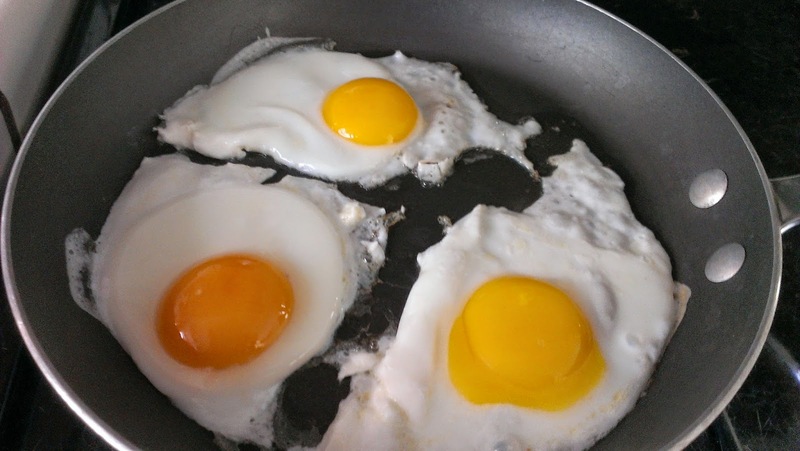 Here's what they look like cooking; that's (1) at the lower left with the darker yolk, then moving clockwise (2) and (3). Holy cow! Look at that thing. Sumptuous like an egg at a fancy restaurant on top of lightly dressed mushrooms. Bland compared to the pasture egg. Yup; the pasture egg has ruined other yolks for me. A lot of it: the biggest egg. Winner, despite the price premium. Clearly better than the other two. And in fact, the price premium is supposed to only be $0.75/dozen, except that it apparently costs my CSA $2.25 per carton to ship these eggs down from the Bay Area. 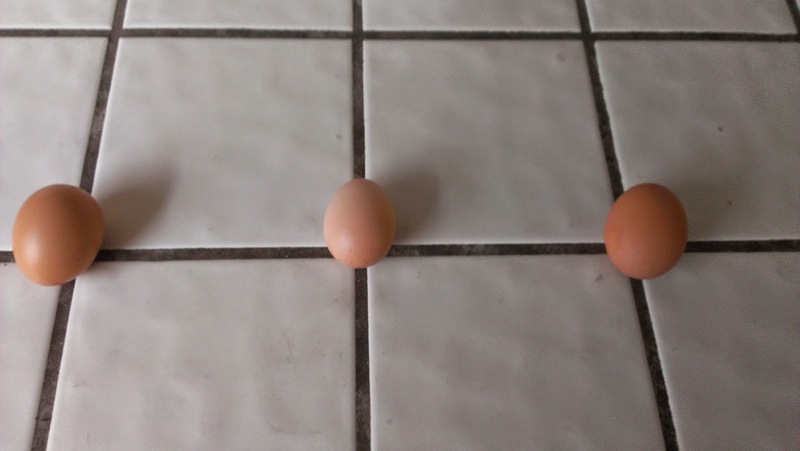 Good; much like the egg to the right. Good; much like the egg to the left. Videos to come, with a breakdown of the fight. The interesting thing about the videos is how different they look, of course, from what it's like to experience it in the ring. These photographs were all taken by the awesome Conor Friedersdorf; thank you, Conor. In between Rounds 1 and 2. I remember Coach D--- (behind me) putting the ice on my head: felt good. Coach is telling me to move around, avoid the punches, throw the knee, more action more action. Fun fact: see that dude in the lower right of the picture above? He's another fighter. By my and a friend's reckoning, L--- and I were the only fighters on the night who were not tattooed. Although one fighter actually applied his tattoos with permanent marker while stretching in the prep room (not the guy in this pic), meticulously giving himself a kind of Maori arm sleeve that stretched up onto his shoulder. Unwrapping after the fight. I remember this moment. I felt good about the fight. I thought I'd won, but also I just felt good. Shakin' hands. L--- said to me: "We showed them what a couple of old guys can do." Class act, L---. On this day, August 15th, our hero took a lot of pictures. It seems like he was newly arrived in Cleveland and at his school, and taking it in. The first photos on this day are of a nice public square -- if I knew Cleveland I suspect I'd recognize it, but I sort of like keeping this whole thing in semi-fictive abstraction. It's paved, but has large islands of colorful flowers planted amongst the paved walkways: they pop with dark red, pink, purple, white, and green grasses. Overlooking the whole thing is a spire of what is almost certainly a landmark building, tapering to a sharp point, stone and early 20th-Century looking, with an American posted atop that is surprisingly visible (you can see some of the stripes) even at a distance. There is a wide shot of the square that captures all this, then some alternate angles that get in closer to the flower beds, revealing an arcing fountain at one end of the piazza. It's a different fountain than the previous series; we're in a new place -- this one (it's hard to tell from the pictures) seems to feature a male form leaping out of the water, or an orb, the form wrought in green metal, muscular torso and arms upstretched, lower half obscured either by swirling waters from which he's bursting or a merman-tail type situation. What looks like a recently built residential high-rise overlooking the square gets photographic attention. Is this where our hero's rented a flat? The next photos are of streets in Cleveland. We begin on E. 4th St, which has signs for a "CLE+ Visitors Center" and something called Corner Alley, the latter advertised on an ersatz old-fashioned neon-style sign. One side of the street is brightly lit, the other (with both the signs) is cast in deep shadow. I wonder if our hero is not perhaps experimenting with the phone's ability to shutter for different light exposures. There are cars parked on the street, which looks like the street of any well-kept district of a well-tended midsized American city. An odd piece of art/signage dominates the middle of the shot: I think it's supposed to be/evoke a giant torch, conical and metal with flames depicted on panels running up its side. It looks like the sort of thing that a city might put up to denote that you're now in the "Downtown District" or the "Wharf Markets," when a city is trying to encourage the use and reality of that kind of neighborhooding concept. This looks like a commercial district. It looks like the sort of place business school students would come to have lunch; it reminds me of having lunches on sunny American streets in Chicago during business school. There are 3 pictures of this commercial street, with signs and restaurants and odd art-poles on the sidewalk, then a strange final picture in this set. It's of a street that's mostly empty: just a couple of cars parked, a couple people walking in a way that just makes the absence of people more clear. All in shadow. It has a side street look; it's narrow, with the traffic lane in one direction actually too tight to even allow for parking. There's a building on it with a nice detailed grey-granite first couple of stories, followed by red brick above, with one of those thick art deco structural awnings. If you zoom in you can see the lettering: Statler Arms. Contra what I said above, I searched and found this. Our hero's residence, in his new city, to which he has come almost certainly to study and is probably studying still, living with doubtless hundreds of others in this building I'm betting near campus in a "gracious apartment home," perhaps with a view of Lake Erie. I had no idea that was possible, the Lake Erie views, even though I've seen Cleveland on the map of course. That's nice. Next: a lot of pictures of intersections. I went to the Sport Climbing Series National Championships tonight, at the awesome Sender One climbing gym in Santa Ana. It was a very fun event; there's a lot of instinctive, visceral drama watching a small human form scale a very tall wall that seems un-scalable, and the athletes were ridiculous. Both my friend C---- and I agreed that the women were more fun to watch than the men. Not, I think honestly, out of some ogling, but because they had a sense of sinuous-ness and problem-solving in their climbing, whereas the men really seemed more like they were using upper body strength to haul themselves up a wall (which was tremendously impressive, of course. just less engaging to watch). This is the moment I wanted to share. What's happening in it is this: the climbers don't get to see the course for long, because that's part of the point -- figuring out the course. So at the beginning, after they are brought out, they get 4 minutes to look at it before going into a holding area before their climb (since of course it'd be unfair if those who climbed later saw the climbs of all those who went before them). But before they go in, they get 4 minutes -- "4 minutes, Climbers." per the announcer -- to chart their route. And when the announcer says that, they do this: they cluster together, holding their hands up in the air, and communicating, miming and talking through how they would tackle a route up this wall. And they do it all together -- they immediately cluster together, all their hands up, like some crazy little sect or dance troupe or group of animals. Particularly after my fight, which is amazing and has community but is very much a thing done alone and in part against someone, this made me smile. All the hands, flapping in and around and imagining the moment when they'd be halfway up that wall, clinging to it with precarious holds, working their way to the top. I bought a refurbished HTC One X (good phone) in the fall of 2013. I tend to buy used phones of 1 generation back, reliving the iterative improvements 6-8 months after the fact. Whoever had my phone before me -- or whomever they sold it to -- didn't know how to wipe it. It was full of music -- mostly Bhangra, or what sounded to me like Bhangra. Before I erased it to save space, my car would sometimes just play this music unbidden when it connected to my phone's bluetooth. Which I liked. It is also full of pictures. Pictures with enough detail to tell me a lot about the phone's previous owner, including a picture of his driver's license. I'm not going to write any of that stuff -- any of the clear markers of who this individual is. I'm also not going to post the pictures. They aren't my pictures, and it's an accident that they came to me. But I think I can write about them, in a non-identifying way, with a clear conscience. They are neat, and tell a story, and I'm going to delete them day-by-day as I do. The first set (the phone's gallery dates the pics) is from 8/15/2013. The last is from 9/9/2013. This already begs a question. Did my former-phone-friend only own this phone for about 3 weeks? If so, why'd he get rid of it so quickly? It's a good phone! The very first picture is of pictures: a hand holding a wallet with 2 people's photographs, who seem to almost certainly be his parents you can somehow tell even before you've looked at all the others. Two South Asian adults. The man's photograph is on top: a blue background, an unsmiling man with a red dot on his forehead wearing a white collared shirt. He has a slightly jowly face. The woman on the bottom looks perhaps a decade younger than the man, in her 40s. Her photo has a red background and is smaller. She also has a red dot, also unsmiling; she's in a sari with a gold necklace. She has a round face. In the lower left hand corner, just barely, you can see our protagonist's thumb as he holds the wallet open to the oval frame into which these passport photos have been placed. His fingernail is a little bit dirty: there's a crescent of dirt between the pinkness of his flesh and the whiteness where the nail has grown out. I like imagining that he took this picture to show his parents his phone and its capabilities, although that is also a foolish thing to imagine on my part as there is no reason to suspect that a phone with a pretty good camera would be novel to someone from India, particularly someone from India with the resources to come to the U.S. to study, as we're about to learn our hero almost certainly has. In the next picture, we meet our hero. He's in a classroom. The shot is a few feet away; the wall behind him is industrial concrete squares, a pattern with gaps between the small blocks of concrete. In the background are other students, sitting in lecture hall seating; a dark bookbag is slung against the tan concrete wall behind a white student in a green shirt. Our hero is South Asian (Indian, we'll later learn). He has on a yellow shirt with vertical grey stripes. He's staring at the camera and at first he looks unsmiling, but that's not right. His mouth is pulled back in what looks like a calm, reasonably content, you're taking a picture of me expression. His hair is short and tidy, parted on the left and combed to the right. He's got a little heft, our guy, though you wouldn't characterize him as chubby or overweight. He's a little meaty. The next couple pictures are of the campus: a terraced affair with patches of green grass amidst concrete and clean sharp buildings with a lot of glass. There is a centerpiece of some kind, between a couple of buildings, made of black stone. Perhaps a marble fountain or something. Everything is edges and straight lines. A couple pictures later we get specific: it is a black marble fountain, with water flowing down its several terraces, and atop the insignia of Cleveland State University. Our hero stands in front of this fountain now, in his yellow button-down and blue jeans, posing contrapposto with left hand stuck in left pocked and left leg slightly bent. This shot is repeated, in various permutations, 8 times. The sun goes behind the clouds and comes out while the pictures are being taken. Who is taking these pictures? The final pictures of this set are of a performance of some kind in a courtyard outside one of the buildings: glass and edges behind it, marble spheres for sitting on planted on a concrete walkway cutting through the grass -- or rather, because there is so much more concrete than grass, a concrete-ed over (this is nice concrete; when I say "concrete" it has kind of rough connotations but I mean that good slick smooth-looking concrete; the color is reddish or tan or light grey). I don't think I'm profiling just because of who our protagonist is -- I'm pretty sure it's some students doing a Bollywood style dance routine. There are three, a man flanked by women either side. All three are South Asian. The man has coiffed bouffant hair, and is wearing a white suite, red shirt with the collar flapping out over it, and light brown (red?) dress shoes. The women are in loose black shirts and slacks, with magenta scarves tied around their waists. They are clapping their hands as the man seems to sing or shout in the first photo, all three of them lifting up their left foot with the dancing. People around are watching, and a man in the background is taking a photograph with a big camera. The next photo they're doing one of those moves where you lean out all the way to the right and point and step that way with your right foot but throw your hip in the other direction. The next photo: the man is jumping, feet off the ground, still singing or shouting! Then he's jumping again, now to the side, as the women throw their right hands up and their hips to the left, smiling widely.